Winter is for white – snow, sheepskins, lights. One of my favorite winter whites is the savory white of the dungeness crab, which comes into season just around the time the nights get longer and the fires get lit. Whip up this deceptively simple risotto for a charming post-holidays dinner party, adorning the table with paper whites and long ivory candlesticks, or bring two big bowls fireside with a throw blanket and a big, bold chardonnay for some rustic romance. Throw on some red lipstick – the hostess deserves to stand out! – serve with a simple winter greens salad, and prepare to indulge! Bring all ingredients to a boil, then reduce to a simmer for 45 minutes. Pour the broth through a sieve, pressing down on solids, then return only the liquid to the stove, keeping the broth at a simmer. Cut the asparagus into one-inch pieces and quickly blanche in the fish stock for 1-2 minutes, then immediately ladle asparagus out and set aside. Keep stock warm. Melt one tablespoon butter and one tablespoon EVOO over medium heat. Add shallots, leeks, and garlic and sautee for two minutes. Add rice, and cook for two minutes stirring constantly, coating and toasting the rice. Add white wine, stirring constantly, until absorbed. Add warm broth, a half-cup at a time, continuously stirring until all of the liquid is incorporated and the risotto has adopted a creamy texture – this should take roughly 25 minutes. * Add remaining 3 tbls. butter, as well as the parmesan cheese, lemon zest, lemon juice, asparagus, chili flakes, and salt and pepper to taste. 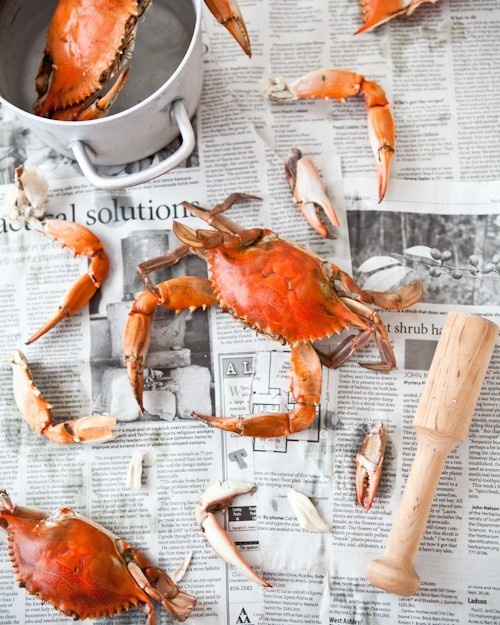 Finally, fold in the crab, spoon into dishes, and garnish with chives and a thin slice of lemon. FISH STOCK PREP: 45 minutes. TOTAL COOKING TIME: 25 minutes. * Fish stock can be prepared in advance, or store bought. I like to add pre-made stock/lobster Better Than Bullion, but this is optional. You may not use all stock.